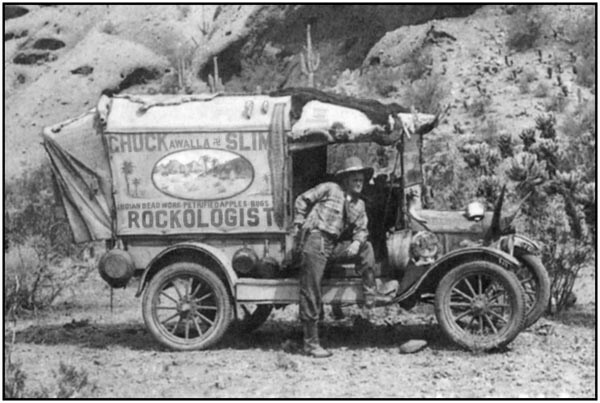 Chuckawalla Slim posed in Papago Park with his colorful truck in the late 1920s. His photographic postcard was popular with tourists. Courtesy of Tempe History Museum. An intriguing snapshot with intriguing details. What was this peculiar a all about? A bit of research reveals Chuckawalla Slim, was actually Edwin Howard Vose II – a gentleman with an impressive pedigree. Born in Massachusetts in 1902, Edwin descended from an early American family that originally settled in Maine, his grandfather was the U.S. Navy Assistant Surgeon during the Civil War. After a two-year stint in the Navy, where the scrawny lad was nicknamed “Slim,” ended in 1921 he joined his family on a trek from Connecticut to Washington State – a 28-day camping sojourn. An attempt at a career as a Merchant Marine seaman failed when Edwin discovered he suffered from acute seasickness. His lifelong obsession with rocks, gems and minerals apparently began with an off chance discovery of a couple of moonstones. When he realized that he could parlay a passion into a career, Edwin’s life path was set. Details of his life are rather sketchy, but within a few years Voss had settled in Southern California. It is there the shrewd entrepreneur adopted the persona of Chuckawalla Slim – a grizzled rockhound prospector. The Slim part of the name we already know. Some believe Chuckawalla came from either a southwestern lizard or a couple of Southern California geographical locations. Initially Chuckawalla Slim travelled the Southwest, including Arizona in the winter, in a mule-drawn wagon, and later a motorized truck. A shameless self-promoter, Slim produced postcards that he sold to tourists. Hence the photographic postcard that accompanies this story. Taken sometime in the 1920’s, Chuckawalla is posed on the running board of his festooned truck in Papago Park with saguaros and famous red sandstone in the background. With his 1975 death in California, the crusty “Rockologist” brought to an end an era of colorful desert characters.